I took my DSLR camera with me when I went for lunch yesterday in the hope of getting some nice shots of the new cygnets. I managed to get a couple of shots before I heard a flapping of wings behind me as Dad came and saw me off. 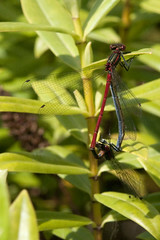 On my way back to the office I spotted this pair of Damselflies next to the lake behind the office. I had to get back a few feet to be able to focus on them as the Nikkor 70-200mm f/2.8 VR won’t focus less than about 1.6mm. I’ve packed my Sigma 105mm macro lens today so I will try to get some more shots of the insects at lunchtime. This entry was posted in Photography and tagged macro, Photography. Bookmark the permalink.